The connection between art and politics has always been a strong one. Throughout the centuries political artworks served as a form of political expression, protest, and satire but art was also used as a unique form of political propaganda. 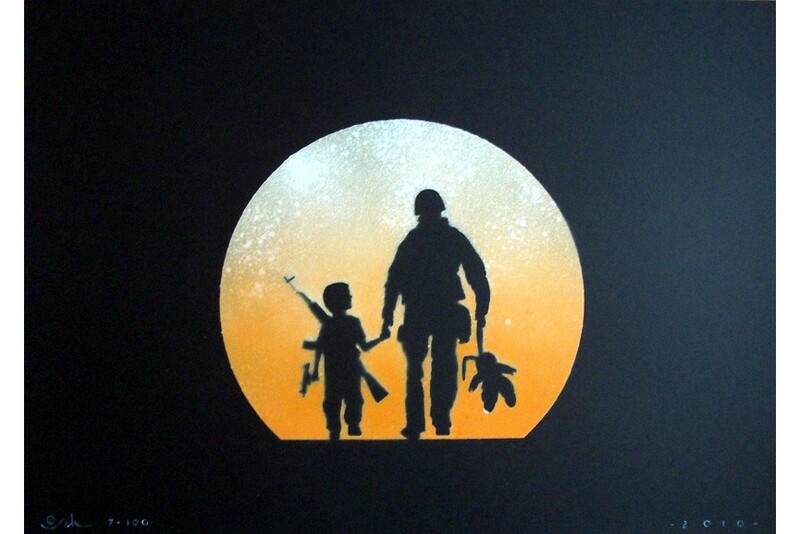 Political art often aims to help people understand relevant political and social issue such as human rights, equality or freedom, but political art is also used as a form of rebellion against injustice and bad political decisions. Finally, many artists use art to show people the funny side of politics by mixing humorous statements and serious social commentary. 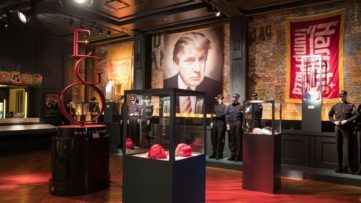 Political art can take on any form ranging from paintings, sculptures, and prints to digital art and collages. 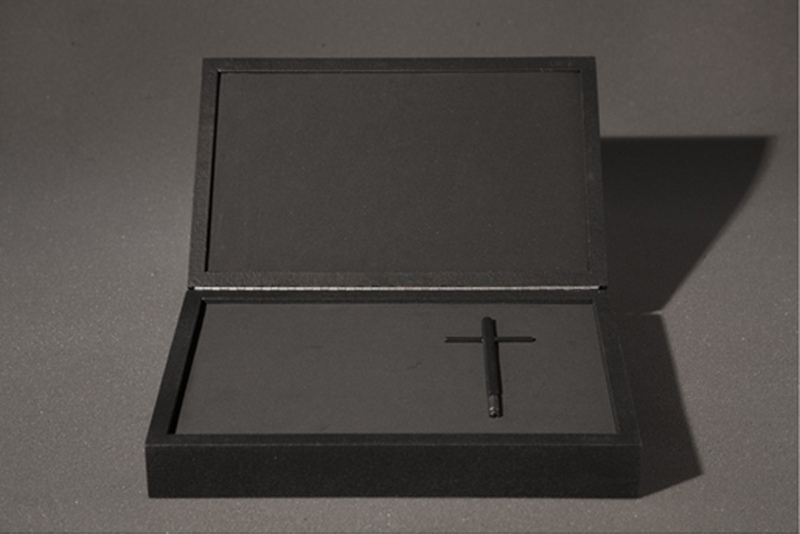 In recent years, artists particularly turned to conceptual art and street art in order to show their disagreement with various political issues. Recently political artwork by conceptual artist Barbara Kruger graced the cover of New York Magazine thus making her our artist of the month. With a presidential election campaign in America reaching its peak, an ongoing war is Surya showing no signs of slowing down and refugee crises troubling Europe, its not surprising that political art is experiencing a real boom in 2016. 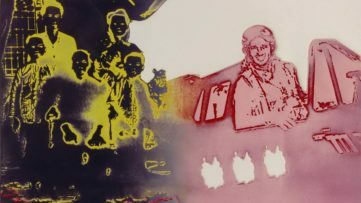 We’ve selected 10 best political artworks you can own right now so if you’re drawn by the power of political art and the social commentary it brings scroll down and find an artwork perfect for your art collection. Her recent piece inspired by the 2016 election may have granted her the status of our artist of the month but we musn’t forget that Barbara Kruger has been making artworks focused on politics for decades. 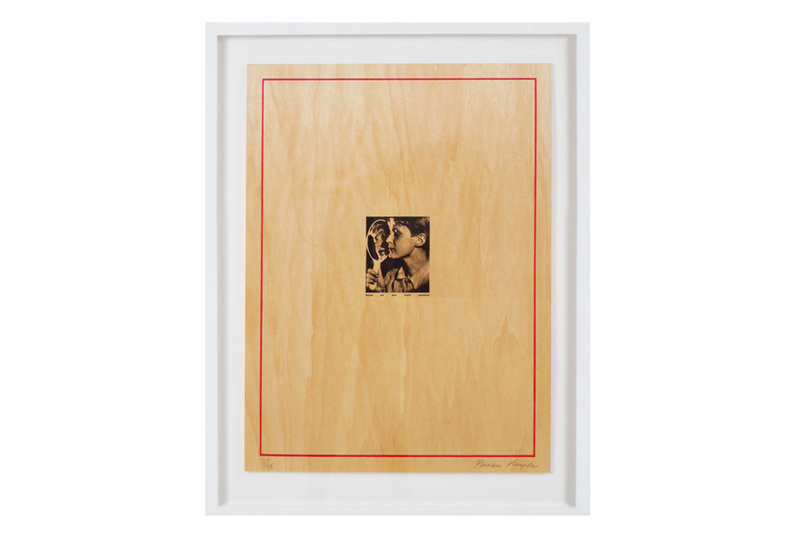 This 1989 lithograph by Barbara Kruger features a portrait of a young child is accompanied by the phrase, “reach out and touch someone.” The artworks are made in the artist’s recognizable style with a human figure places in the center and suggestive texts incorporated below. Robert Indiana created Golden Future of America as a reference to the America’s idea of the Golden Age. The artwork that simultaneously represents its creator’s satirical comment about the American dream has a strong political undertone. By incorporating Benjamin Franklin’s quote that states “In free governments the rulers are servants and the people their superiors and sovereigns” the artists suggests that power lies in the hands of the people rather than the rulers. 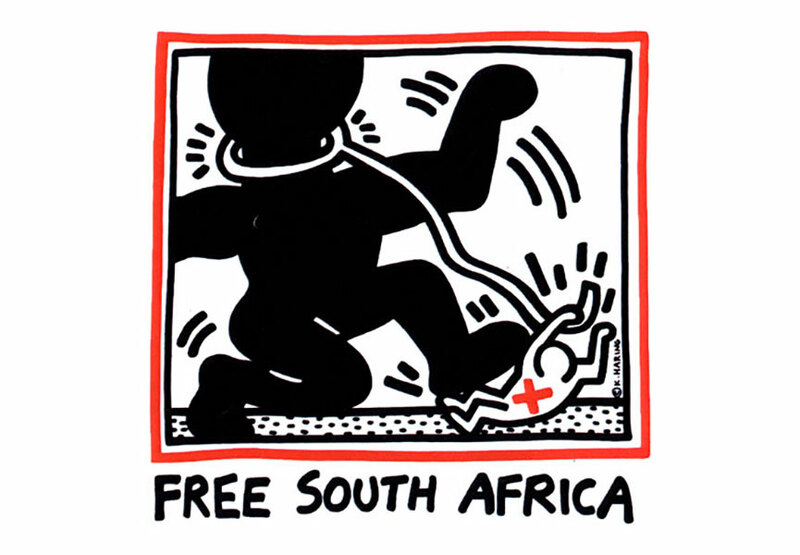 Keith Haring’s Free South Africa represents a political response to the apartheid system in this country. The black subject on the artwork is painted much larger than the white one to depict the irony of a post-colonial era where a white minority continued to repress the native population. 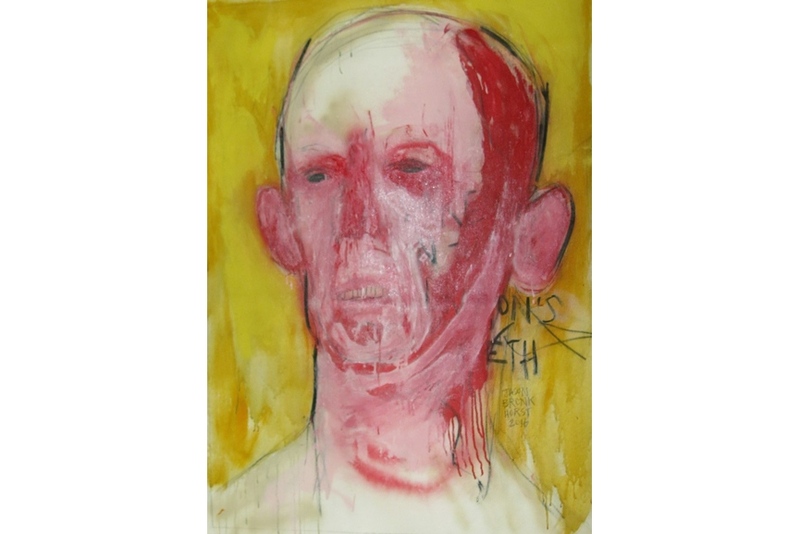 In this special offer, you can get a complete set of three individually signed, dated and numbered lithographs. Street art legend Blek le Rat has been bringing his unique brand of political graffiti to numerous walls around the globe for almost 30 years. The Bombing Squad is reminiscent of the artist’s famous 1984 graffiti artwork that referenced the growing fear of a possible invasion of Russian soldiers in France. Art-maker who is known for his politically charged artworks and exquisite stenciling style, and one of the best graffiti artist of today Banksy made this thought-provoking artwork as a comment on the consumerist culture in the West. 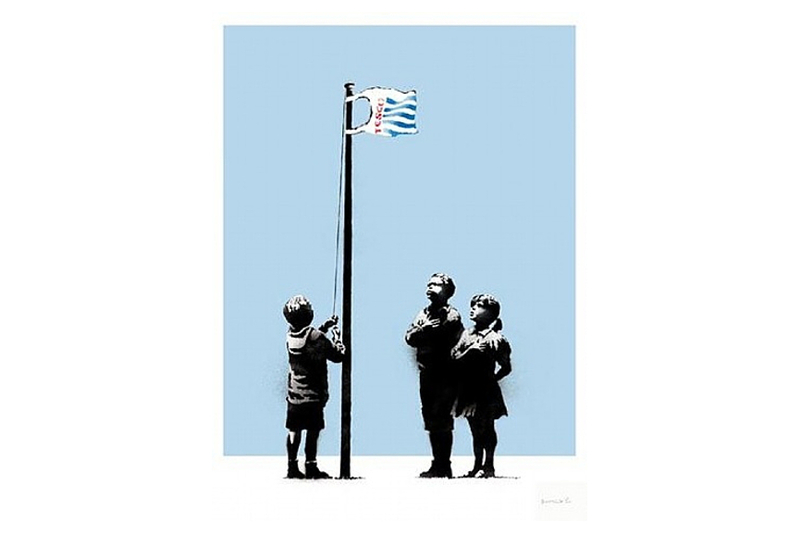 This entertaining piece depicts a group of children pledging their allegiance to the great British supermarket chain Tesco. We can see a group of children saluting, to a Tesco carrier bag raised on an electricity cable that’s transformed into a flag pole. When Shepard Fairey’s art meets George Orwell literature a magic happens. 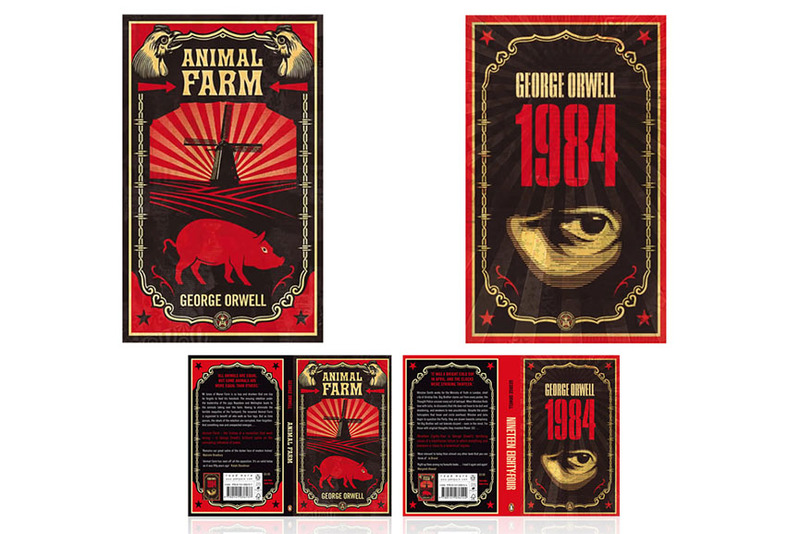 In 2008 the celebrated street artist-designed covers for two Orwell’s classics 1984 and Animal Farm and gave his own captivating take on the famous stories. The books that reflect events closely related to the cold war and the Stalinist era got an eye-catching front that powerfully conveys the fear and paranoia that marked an entire era. Artist Jordan Seiler has extended his participation in the PublicAdCampaign by designing these useful public access boxes. Each box contains a key that can be used to open more-less any billboard case in the world. The artworks are perfect for those who are willing to join the project’s goal of replacing advertising billboard with art pieces. 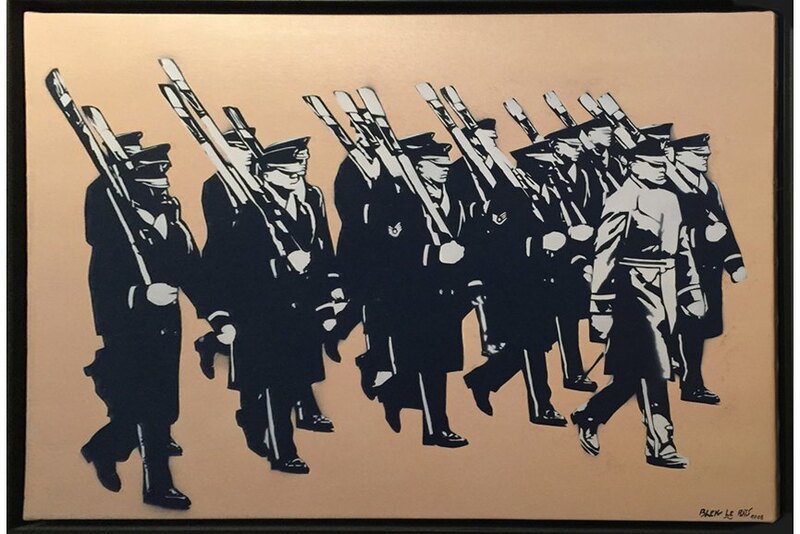 South African artist Jason Bronkhorst never shy away from making political commentary. His latest series entitled The Board of Directors deals with an array of political and social issues such as post-colonialism, capitalism, patriarchy and white supremacy in South Africa. This depiction of an African Dictator evokes the notion of brutality and raw force. Chilean artist Otto Schade spent years decorating the streets of London with his striking images of sundown. His art pieces are vivid and multi-layered with incredible detail and depth. 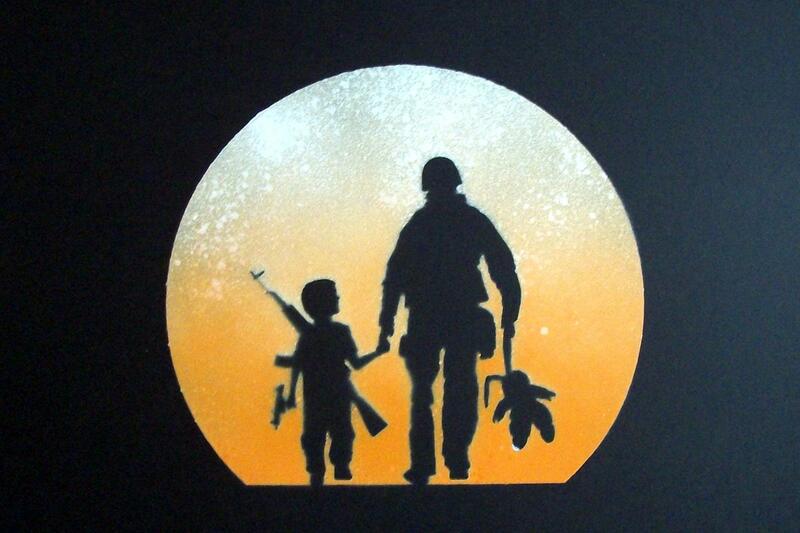 His No Comment artwork appears simultaneously carefree and frightening as it features a comic-like depiction of a soldier and a young child. 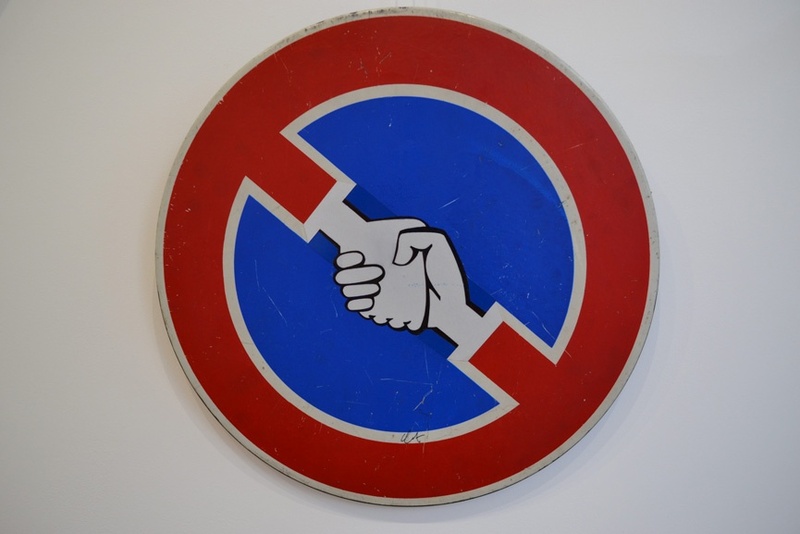 Clet Abraham is known for high-jacking traffic signalization and turning it into works of art. This particular sculpture is created by placing a sticker on top of a road sign. 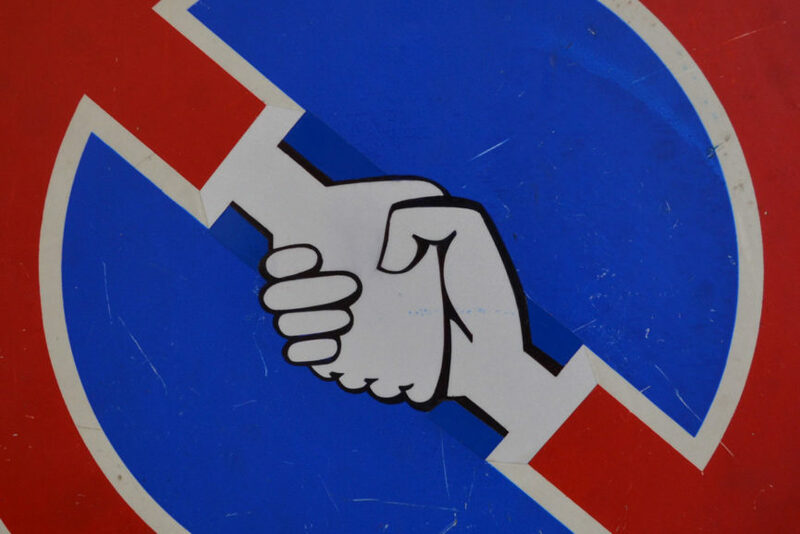 Solidarite artwork is self-explanatory and depicts the human need to help each other out in the times of need. Click here to find out more about Clet Abraham’s Solidarite.